Shortly after arriving in London from Scotland in September 1974, the artist was invited to take part in the “Arts Festival for Democracy in Chile”. This was organised by Artists for Democracy, which had been founded that May as a response by artists to the military coup which had brought down the government of Salvador Allende in September 1973. 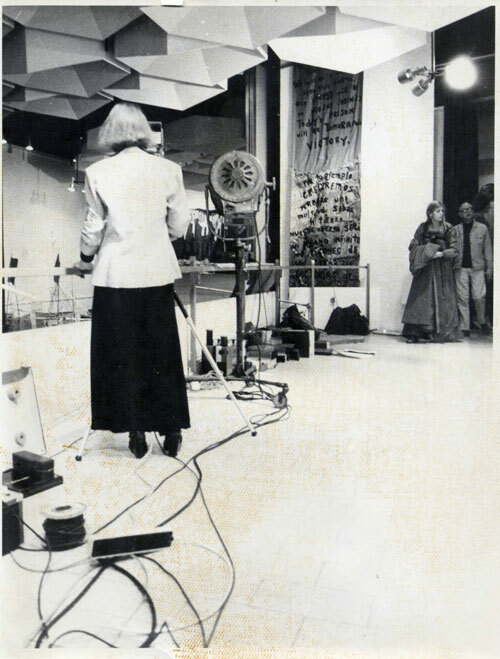 The festival was held at the Royal College of Art in London in October 1974, and included contributions from artists from all over the world. Lynn MacRitchie videotaped the opening ceremony and many of the discussions, performances and events which were held during the festival. The tapes show participants including the artists Roberto Matta and Jorge Immendorf, the writer Ariel Dorfman, former Chilean ambassador Professor Alvaro Bunster, the actress Constance Cummings, the trade union activist Brian Nicholson, performance artist Dirk Larsen, print makers John Phillips and Pippa Smith, musicians Caboo and AGOR-MMBA, dancers Craig Givens, Betsy Gregory and Martha Grogan and AFD founder members and supporters including David Medalla, Guy Brett, Cecilia Vicuna, Mavis Penn, Jonathan Miles, Steve Sprung, Jun Terra, Colin Grigg and Roberta Hunter Henderson. Some forty years later, the artist was invited to show the videos in the exhibition “Artists for Democracy: the Archive of Cecilia Vicuna”, in Santiago, Chile, January - April 2014. In order to be played on modern equipment, the tapes had to be digitally remastered. As part of this process, the tapes needed to be “baked” (treated with heat to seal their surfaces) twice. Their great age and the extent of processing required to digitise them inevitably affected the quality of sound and vision in the final digital version. Their value as historic documents has only increased with the passage of time, however, and the artist has donated a version of the digitised videos to the Museum of Memory and Human Rights, Santiago, for its permanent collection.